The International Conference on “Reduction of water consumption in CSP plants” in Marrakech on 24th-25th April 2018 showed how water in CSP plants can be saved by applying new approaches in mirror cleaning, cooling system solutions and overall plant performance simulations. Hosted by MinWaterCSP, the event attracted around 100 stakeholders from around the globe and presented results of three EU funded projects. Concentrated solar power (CSP) is a promising electricity generation technology full of growing potential. However, traditional wet-cooled CSP plants often consume large amounts of water which especially causes a challenge in arid areas where water resources are scarce. The two-day conference gave valuable insights into innovative solutions for mirror cleaning and anti-soiling, cooling systems, axial flow fan development, simulation-based analysis of CSP plant water consumption and water management strategies. In addition, participants got the exclusive opportunity to visit the demo-site at Green Energy Park in Ben Guerir. The event was organised by MinWaterCSP and hosted by the Research Institute for Solar Energy and New Energies, IRESEN, Morocco. In addition to industrial and research partners from the MinWaterCSP project and further invited experts, the EU funded projects WASCOP and Raiselife contributed to the Conference program with their expertise in simulation and soiling. All three projects are funded under the EU Horizon 2020 Research and Innovation programme. The key notes in the morning of 24th April introduced challenges in energy production and water consumption in Morocco by high-level representatives of the Ministry of Energy, Mines and sustainable development of Morocco and the OCP Group. In addition, MinWaterCSP industrial partners gave an overview about the technologies developed by the project consortium to tackle the challenge of significantly reducing the water consumption of CSP plants while maintaining the overall cycle efficiency. Thus, they addressed technologies used for water treatment, direct hybrid cooling as well as to achieve water savings in mirror cleaning. One of the aspects highlighted during the conference were new approaches in mirror cleaning. Thus, truck-based and robot-based mirror cleaning technologies were presented. These technologies allow to optimize the cleaning process and thus to save water, reduce cleaning operation costs and improve plant performance. Another topic addressed during the parallel sessions were cooling system solutions. A novel hybrid dry-wet cooling system developed within MinWaterCSP was presented that allows to reduce water consumption by up to 85-90% compared to traditional wet-cooling systems. Through the use of wire structure heat exchangers for air cooled condensers (ACC), which are part of this dry-wet cooling system, material savings are possible. Moreover, Axial Flow Fans employed in air-cooled condensers are optimised so that auxiliary power consumption is reduced by up to 10% and also noise level reductions are achieved. Thanks to the further developed ColSimCSP simulation software, the overall plant performance can be tested and optimized with regard to water management and water consumption reduction, plant operating strategy and cleaning schedules. During a panel discussion with industrial focus on the second day, partners from the CSP projects MinWaterCSP and WASCOP shared and discussed their best practices with a special focus on different aspects towards water saving needs in CSP plants. Also social and efficiency aspects were discussed with regard to industrial cleaning versus manual cleaning of mirrors in CSP plants. One of the highlights of the conference was the site visit at Green Energy Park in the afternoon, where participants got insights into the demonstration of some of the project results. At the containerized fouling test rig, consisting of four small deluge cooling towers, visitors could watch how researchers of IRESEN, Kelvion Thermal Solutions and ENEXIO investigate the effect of fouling on thermal performance and the overall lifecycle in dry/wet hybrid cooling systems. 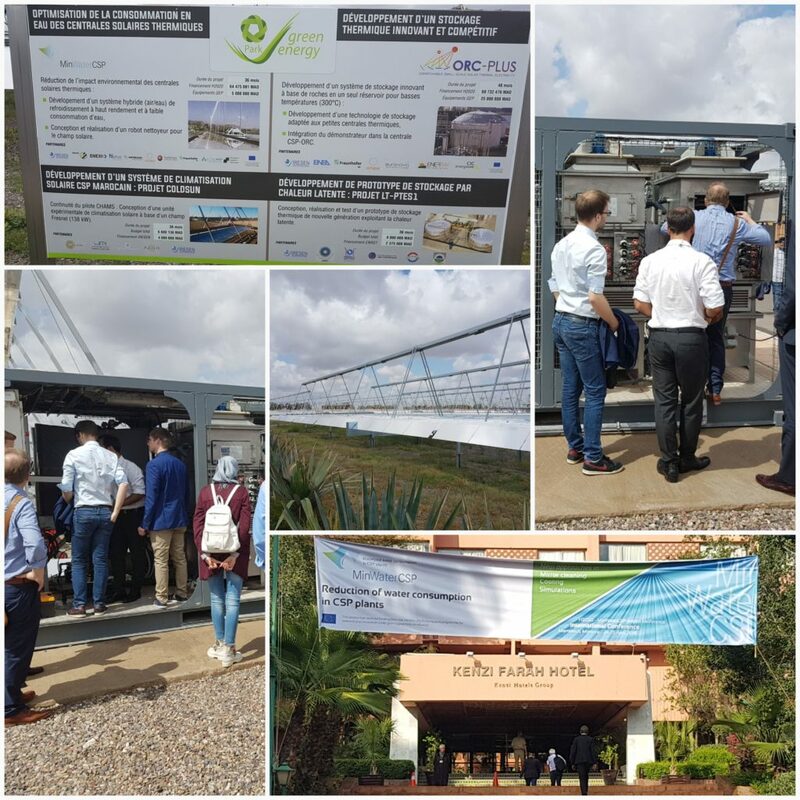 In addition, visitors had the opportunity to see the various soiling level measurement tools used to assess the performance loss of local CSP mirrors due to dust and observe the operation of a novel automatic cleaning system developed within the project. SAVE THE DATE! The MinWaterCSP consortium will continue their efforts to minimize water consumption in CSP plants and will present their final results at the final conference on 7th-8th November 2018 in South Africa. More information will follow on this website, via the MinWaterCSP eNewsletter as well as our Social media channels. Steinbeis 2i is committed to working in the areas of innovation and internationalisation, building on over 25-years of experience of Steinbeis-Europa-Zentrum. The core activities of the Steinbeis 2i are to assist organizations to participate in European R&D projects, to support the management of international research projects, to give assistance in the exploitation of research results, to promote transnational technology transfer and to stimulate and support the innovation process in industrial companies and to provide professional training. In MinWaterCSP, Steinbeis 2i is coordinating the communication and dissemination activities and is linking MinWaterCSP partners with the other LCE projects. Further, S2i performs the administrative and financial project management and coordinates the exploitation activities linked to commercial project results. IRESEN’s main objectives are to lead and promote R&D in the field of renewable energy, to carry it to a higher level and national scale, hereby defining research topics, coordinating and optimizing the overall research process. IRESEN has made several calls for proposals to stimulate research initiatives in Morocco and is leading several national and international research projects on both Photovoltaics and CSP.